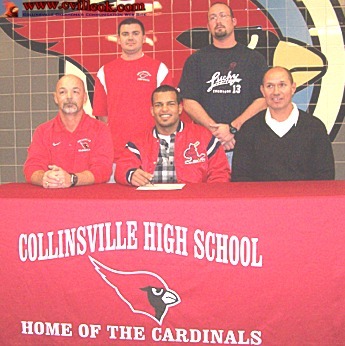 CHS senior short stop Jose Olazagasti signed a letter of intent to play baseball for Seminole State College Jan. 15, 2010. Jose was joined (above) at the signing by Seminole State Coach Jeff Shafer (seated right) and CHS Head Coach Tony Reeder (seated left), and Coaches Matt Davidson & Damon Herald (standing). 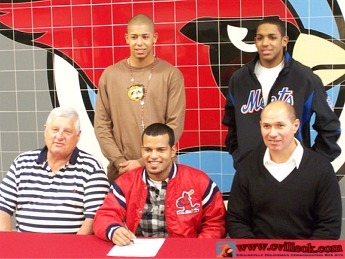 Jose was also joined at the signing by his CHS teammates Luis Dejesus (standing left) and Peter Rodriguiz (standing right). Seated at the table with Jose were Nobie Hudson (guardian) and Coach Shafer. Coach Shafer indicated he had high expectations from this Cardinal having already coached former Cardnals Kevin Phillips and David Chester. 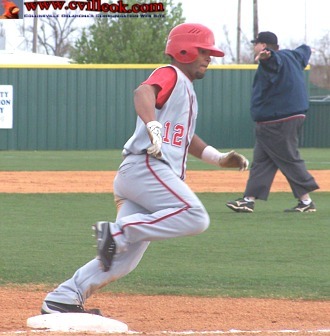 Jose Olazagasti heading to home plate for the CHS Cardinals against Bixby March 19, 2009. 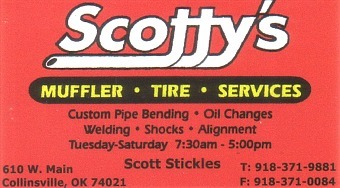 Apr 21-24 McAlester Shootout There TBA .